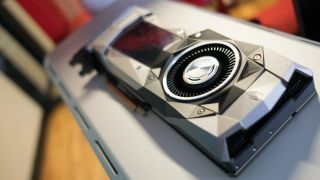 Nvidia has just released new drivers for its PCIe graphics cards to ensure compatibility with the latest version of macOS 10.13, known as High Sierra. Driver version 378.10.10.10.15.114 introduces a raft of performance tweaks and bug fixes, along with compatibility for Pascal-based (i.e. Nvidia’s latest) GeForce and Quadro GPUs in the current version of High Sierra. This means that those with a Mac Pro running these graphics cards can (at least theoretically) safely upgrade to macOS 10.13. Also note that beta support has been introduced for iMac and MacBook Pro systems which are hooked up to external GPU enclosures using the aforementioned Nvidia graphics cards. However, remember that the latter is still in beta, so the results you get could be somewhat unpredictable at this point. As 9 to 5 Mac reports, there’s a useful ‘Hackintosh’ (a term that refers to running macOS on non-Apple hardware) thread on the new drivers here, including advice on how to tackle any possible issues you might encounter. You can grab the new GeForce (and Quadro) driver here, and there’s also an updated CUDA driver (with version 9.0 of the toolkit) here. Apple revealed its own first-party external GPU box aimed at developers back in the summer, and the consumer version of this graphics supercharger is expected to be available in the spring of next year. Of course, there are alternative third-party solutions already out there. In other graphics news today, Nvidia chief executive Jensen Huang is still banging the drum about Moore’s Law being dead, with a fresh assertion (spotted by PC Gamer) that GPUs are going to replace CPUs entirely before too long, simply because of the pace at which GPU design is advancing.